How "affordable" is the Control4 controller for a single room setup (HC-200)? I always thought the iPad would be a perfect controller for a digital library, is that what the control4 is? Know this though, whether it's a iPad, iPhone or an android device, these touch control devices are about to put a big hurt on the remote control industry as we know it. These companies had better begin to look into joining the app party fast!!!! I've been dying to know more about (iPhone/iPad) remote control programs Bats so I'm in on this one for sure. I haven't had the chance to download it yet, but there are a couple of apps for my EVO where I can control my Squeezebox. It supposed to have the artwork on the phone and everything. I use an app called iPeng to control my Squeezebox via iPhone - it's pretty freakin' sweet. I tried Squeemote first but it kept jacking up - I'd select an artist and the albums for a different artist were listed. iPeng has worked flawlessly. URC has some really cool IP based control products. They can send IR commands over TCP/IP and the bases then send them out via the IR flashers or even RF antennaes to other base stations or URC lighting. The only real problem with solutions such as the URC products is the pricing. The remotes (or keypads) start @$1,500 and the base stations start @n $250 for the non-TCP/IP ones. I haven't seen the pricing for the MRX-1 (the IP addressable base station). You have more access to information than I do. I wasn't able to find any iPad charging mounts but I did stumble across an article that reported that Sonance had a patent on iPad/iPod wall mounts for charging and communicationg with a controller. I think you can use the iPad's wifi to talk to the Control4. 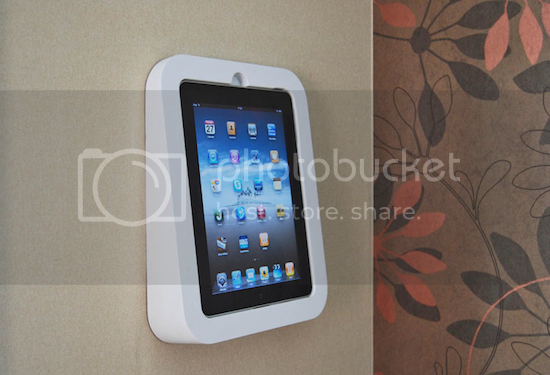 If so you don't need a hardwire connection between the controller and the iPad so why not build a shallow recess or shelf into/on the wall and use a 120v-to-USB adapter with a regular iPad dock? 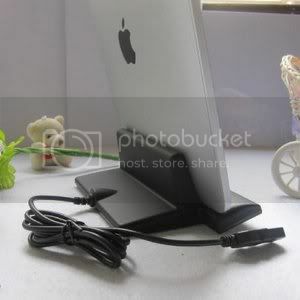 Or use one of the commercially available surface mounts that have room for a cable. What are the advantages of the Control4 over the URC products? I know the store that I work with is also considering doing some things w/ Control4, so I'd like to hear real opinions as opposed to sales jargon. John, I'm not necessarily locked in control4 just yet but they do seem to have the most affordable options right now...the advantage is (as far as the iPad is concerned) is that URC won't have any software until Q1 2011...URC may come out with something that trumps everyone but right now they have nothing to offer. Tom, I'm not opposed to that at all if I have to go that route but I'm looking to mount it to one of my seats in an articulating mount and it would be great to keep it charged in such a mount. But if they aren't out there, I'll probably use a dock like the one you pictured and keep it docked near the entrance. I got it last night. I wanted the remote from Squeezebox ($200 I think) then I heard about apps to do the same. Research suggested that iPeng was the way to go. So far it's worked flawlessly and I'm thrilled that I can control my Squeezebox from anywhere! ...the advantage is (as far as the iPad is concerned) is that URC won't have any software until Q1 2011...URC may come out with something that trumps everyone but right now they have nothing to offer. I'm a little confused by that. URC is coming out w/ what type of software in Q1 11? What I was bringing up w/ URC doesn't require software. It requires a network (just as an iPad or any other app would) configured w/ static IP addresses (which would be the best no matter which network based control you were using). The advantage that I see for URC is that not only can you get 2 way data and control of things such as playlists, web-based media, etc., but also allows for standard IR commands to be sent via the same network. This means that you can control your entire system w/ the one device. AFAIK, only companies such as Control4, Crestron, and URC are doing this. The apps for other devices such as the iPad can control the newer equipment which has network capabilities (and sometimes a limited set of commands) and you can sometimes add some IR functionality to some of these devices. However, the "be anywhere control everything" aspect requires implementation of standard IR functionality. I would love to have the ability to fully control a system w/ an iPad. I would want to be able to use Windows Media Player instead of iTunes for my music library, though. There's also still the issue w/ not having to point the iPad to control the rest of the system. So that briongs us back to the availability of a controller. I'd really like to know more about Control4. Is it something that has to be programmed by a dealer?